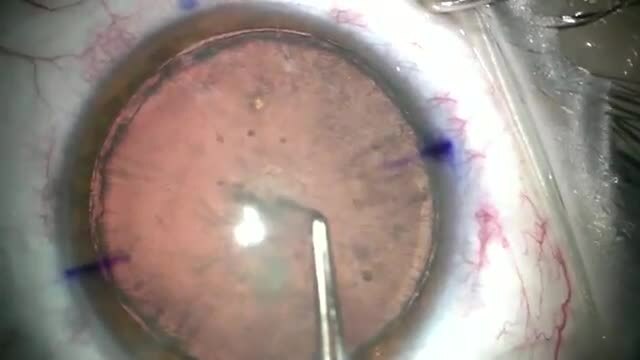 Suresh K. Pandey, MS (PGIMER), ASF (USA), and Vidushi Sharma, MD (AIIMS), FRCS (UK), demonstrate the steps taken in small-incision cataract surgery using the fishhook technique and rigid PMMA IOL implantation. this sutureless small incision cataract surgery has been found to be superior to phaco, including uncorrected va, astigmatism, and corneal health. it was published in one of the major journals a few years ago. You don't suture scleral incision? And why didn't perform phacoemulsification as usual? I've done a few in cataracts like this, even with "metric" (total energy) around 100 and w/o corneal descompensation.